In July of 2014, New York State did what few thought possible at the time: Its legislature passed Assembly Bill 6357 (better known as the Compassionate Care Act of 2014), which effectively legalized medical cannabis; a bill Gov. Andrew Cuomo signed into law. Less than a week after he did so, Leafly, a cannabis information database, made headlines of its own by running an advertisement in The New York Times' -- the first of its kind in the venerable newspaper's 163-year history. Cannabis, both as an industry and as a subculture, is quickly coming out of the shadows and entering the mainstream. Nowhere is this more explicit than in the meteoric rise of Leafly. So to get some insight into the company's rapid growth and future plans, I recently spoke with co-founder Cy Scott and CEO Brendan Kennedy about where Leafly came from and what it's like to be an industry pioneer. The Compassionate Care Act in New York was really your big debut with your full-page ad in The New York Times. What sort of effects to the business have you seen emerge from that event? Cy: One of the biggest benefits was, obviously, the media picking up that ad. We were in New York at the time and it really helped us "plant the flag" so to speak. We already had a number of users from New York, but to have it "top of mind" was really invaluable for us. Brendan: It was really important that we ran that ad. We had actually designed it almost two years before we ran it and we designed [it] more as a project as to what we thought the first mainstream ad would look like. Then we put it on the shelf for two years. But when Gov. Cuomo signed the CCA, I believe it was July 7th, we almost ran it that week. But then when The New York Times editorial board came out in favor of ending the prohibition, that's when we knew we had to run it. It took us less than six days to get the ad finalized and in place. It was a big story for us. 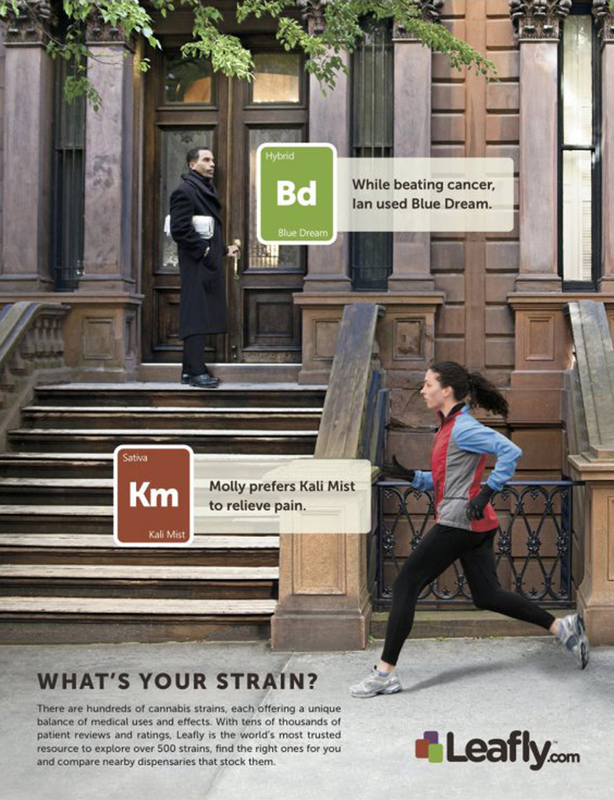 It was important, not just because it was the first cannabis ad in the history of The New York Times, but that it was done right and didn't embrace the stereotypical cliches. That ad was covered in about 360 stories in 97 countries and they [The New York Times] told us it had roughly 400 million impressions. Weedmaps reportedly had its Times Square billboard campaign yanked minutes before it was supposed to go live just a couple months before your Times ad ran. Was there a concern that, like Weedmaps, you would be denied publication? Brendan: You know, I don't know if that was a publicity stunt or what. What we've always liked about Leafly is that it's a mainstream brand offering a mainstream product consumed by mainstream Americans. There's a counterculture, a subculture, but there are also average Americans in New York and Kansas and Oklahoma that consume this product. They're just looking for brands that don't insult them. That's why Leafly doesn't have all the stereotypical cliches. You can show Leafly to a 25-year-old; you can show it to a 50-year-old soccer mom; you can even show it to someone's grandmother. That's not true for every brand in this industry. Though The New York Times ad brought the fledgling company global notoriety, its publication was a far cry from Leafly's humble beginnings. 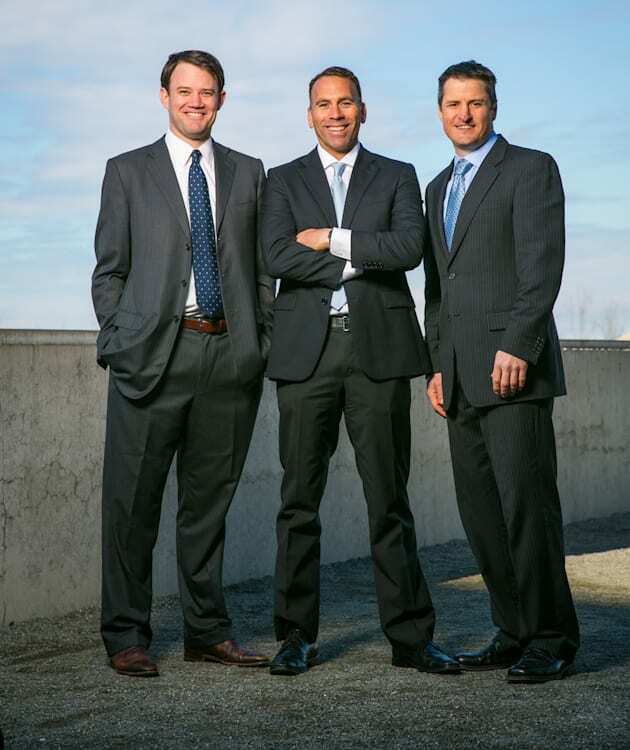 Cy, Brendan and co-founder Scott Vickers met in college. How did Leafly get its start? Cy: Scott, one of the original founders got his doctor's [recommendation] and went to a dispensary and was presented with an overwhelming selection of different cannabis products. At the time, we were familiar with the general categorization of different strains -- you know, indica, sativa and hybrids -- but we didn't understand how nuanced the strains could be, the different effects they could have and the different reasons people would take one over another. And so in tracking that, [we solved] our own problem using spreadsheets to understand what we did and didn't like. Like most startup stories, just sort of recognizing that there's something missing in the market. We figured if we had this need, others would as well -- a location or service where people could go and read reviews or create a journal of what they like and aggregating and anonymizing that and presenting it back to other people that are interested in the same space: new patients, new consumers looking for good information on strains. Five years ago, most digital platforms targeted that common stereotype of a cannabis consumer. We wanted to target a more mainstream audience. We saw the trend happening in terms of mainstream adoption and acceptance of medical cannabis. We thought that it would go that direction with more states adopting it. So we decided to build a platform that had a great visual representation; something that people could use in their workplace or wouldn't be embarrassed looking at. Since then, multiple states have legalized recreational use as well as medical and we've seen incredible adoption of the platform as well. We started with the foundation of strain reviews and then understood that we really wanted to connect people to locations where they could acquire a particular genetic strain. So, we integrated a dispensary-locator service where people can rate and review specific dispensaries much like they'd rate and review specific strains. You can see a dispensary location and read its menu so you know what to expect when you arrive. From there, we realized that we needed some good editorial content. It's something that's been doing really well for us. People, new patients, that are new to cannabis are really looking for good information. Also, people that are coming back to it, that tried it once when they were younger, but now that it's legal in certain markets, they want to learn more about it. Also new patients that are looking for something that will help them with specific conditions and symptoms are coming to Leafly. From just three founders and 17 strain reviews, Leafly has grown to more than 35 full-time employees and a database of nearly 147,000 reviews today. The site now generates close to 6 million monthly visits and 31 million page views across both its web page and mobile apps. What's more, Leafly's readership continues to grow at a steady rate, averaging 10 percent month over month over the past two years, although 75 percent of that audience is based in the US. As such, Leafly's product offerings have expanded along with its payroll. The company now offers not just strain, doctor and dispensary guides, but also an impressive archive of cannabis-related knowledge as well. Leafly boasts a five-person editorial staff that regularly produces content ranging from basic information like the Cannabis 101 series to cultural features. Its growth is one of the team's primary goals for the year. How do you maintain editorial control for something that is inherently crowdsourced? Well, when we list a new strain, we control that directly. We have people on staff that do the research and work with our genetics companies to really understand the lineage and background of the strain. We add those as we stumble upon them or connect with new genetics companies or producers who are making their own crosses then requesting they be included. We control that so it's not just any old strain or location that someone randomly adds to the system. As far as reviews, we have a Helpful/Not Helpful system where people can tag them -- like up or down voting -- so the content that isn't great gets pushed down, buried and eventually moderated to keep the system pretty clean. As for video: What brought about the decision to add video content to the site and where do you see it going from here? Cy: Video is something we recognized we'd been missing for a long time. We really wanted to create an audience on our YouTube channel and to do that we really needed some original content. We batted around a bunch of ideas using the strain data and auto-generated videos, but nothing really connected until we started producing these new ones. For example, we have a host; her name is Regina. She's a fantastic representation of the brand. It's a great set. We get feedback from people all the time wanting to purchase things they've seen on-set (like the Cannabis Guide). It's a lot of that original 101 content to get people comfortable with things like consumption methods or stuff that we take for granted working so closely with cannabis. But people have a lot of questions about stuff like the properties of strains. We'll go really deep on specific strains like Blue Dream, talking about the foundations and background of it, different effects, et cetera. Being so uniquely positioned within the market, have you run into any added legal or regulatory troubles? Cy: Other than typical industry challenges, no. I mean, everything in this industry is more complicated than people think. It took us a long time to find the right bank, even though nothing Leafly does is a violation of local state or federal laws. It takes time to find partners that are willing to think about this industry. And has it been getting easier as cannabis grows in acceptance? I think it's easier today than four years ago, certainly, but it's still not nearly as easy as any other industry in the United States. Even though Leafly currently boasts an impressive (and seemingly uncannily sustainable) rate of growth, it's not content to sit on its laurels. The company reportedly has a number of new features and innovations in the works that will be announced in the coming months. You've already got revenue from ad streams and sponsorships; how else are you looking to expand your business? Cy: One of the fundamental issues with this industry is that traditional digital marketing channels limit cannabis advertising. So if you're a producer or processor or retailer in the market, you can't advertise. You can't advertise on platforms like Twitter, Instagram or Google. And neither can we, even as an ancillary business in the industry. We are working on some product offerings and services that will fill that gap for new and returning customers. We're also working on more editorial content, looking towards new markets that are opening up (and we see new interest every time -- one to three times the average every time a new market opens). A good example is DC, we saw a 3x increase in traffic both leading up to and following legalization there. And with new markets come new consumers. So yeah, definitely expanding editorial to support that new audience as well as new services and product offerings. And where exactly are you looking? What areas do you think will be next to legalize it? We're looking at all different markets. Some of which we've been looking at lately have been Oregon and Alaska given that their regulatory frameworks are coming together. Within the next few months (up to 18 months), they should have stores opening up, so those are fun for us. There are also medical markets like Nevada, specifically Las Vegas. They're about a month away from opening up their first dispensary. That should be a pretty big market. I believe they have reciprocity there so you can use your doctor's recommendation from other regions. As for what we do when a new market opens up, it really depends on the location. A lot of times, we'll participate by sponsoring a number of local events in those regions. We have field marketers and reps; sometimes we'll deploy them out to those regions to have a presence on the ground -- start making connections and contacts in the industry. And when [recommendation] markets open up like in Seattle, we had a food truck day in a bunch of different locations. We had a bunch of Cannabis 101 materials to hand out that really resonated with consumers. It really just varies within each region. What plans do you have for the API program? We have a lot of sign-ups for it. We actually have a hackathon here in Seattle this weekend called the Grassroots hackathon and it's being done at a Wee Works [Preschool] office. The hackathon revolves around the API (we are a sponsor), but it's a great way for people like Meadow to get access to this data. 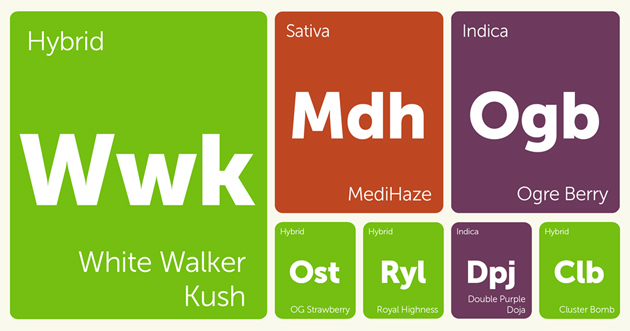 And as we add new features -- we only offer strain and dispensary data at the moment -- we'll expand. We don't do editorial content because we've got agreements with a couple of other companies. We should have some good stuff coming out later this year, stuff we can't talk about just yet, but we'll expand the API once those are in place. Of course, even industry pioneers need to relax every once in a while. Cy: I'm a pretty regular consumer, but I don't smoke. I prefer vaporizers these days. So it really was a matter of us solving our own problem. We had our doctor's [recommendation] in California. We had exposure to a lot of strains initially and that's where the interest and impetus, in part, came from. Cy: I actually just got the Pax 2. It's fantastic. Obviously, we don't consume at work or anything since we've got a lot we need to get done. But I use it to unwind in the evenings.